On June 3, 2014, Belarus’s President Alexander Lukashenko received in audience participants in the 4th Orthodox-Catholic Forum “Religion and Cultural Diversity: Challenges for Christian Churches in Europe”, which opened yesterday in Minsk. 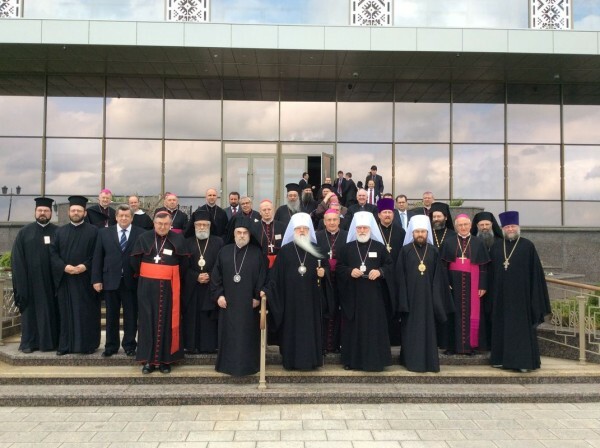 The meeting, which took place at the Palace of Independence, was attended by Orthodox and Catholic hierarchs and theologians from 22 European countries. Mr Lukashenko welcomed the guests, stressing that the life of Europe is based on the Christian worldview. The co-chairmen of the Forum, Metropolitan Gennadios of Sassima (Patriarchate of Constantinople), and Cardinal Peter Erdö, Archbishop of Esztergom-Budapest, greeted the president. Metropolitan Pavel of Minsk and Slutsk, Patriarchal Exarch for All Belarus, addressed himself to President Lukashenko. Metropolitan Hilarion of Volokolamsk, head of the Moscow Patriarchate Department for External Church Relations, conveyed to the President of Belarus a message of cordial greetings from His Holiness Patriarch Kirill of Moscow and All Russia. Noting that the Primate of the Russian Church holds Belarus dear to his heart in a special way, His Eminence noted that all the guests delighted in seeing the high quality of roads, intensive construction work as well as achievements made in many other fields. “Many ask us: What is the secret of this success? It lies, in no small measure, in the spiritual unity of the Byelorussian people. For the last years, the country has managed to avoid a cardinal threat, a schism in the Orthodox Church, which unites most of the country’s population. The Church has preserved her unity and lives in harmonious coexistence with the Catholic community and other traditional confessions in the country. It is not accidental that precisely Belarus has become a venue for our forum”, Metropolitan Hilarion said. “We see a different picture in the neighbouring state of Ukraine”, he continued, “There was a schism there in the early 90s, which was supported by the state. A dangerous and erroneous slogan was put forward: ‘An independent Church for an independent state’. They encroached on the most sacred thing – the unity of our great multinational Church uniting fraternal peoples of Byelorussia, Russia and Ukraine. The Uniates, too, made their own contribution to it. As a result, the people are divided and now the unity of Ukraine as state is under threat”. In conclusion of his address, the DECR chairman presented the leader of the Byelorussian state with a book on the Department for External Church Relations, noting that for 20 years it was directed by the present Patriarch Kirill and before him it was headed by the present Honorary Exarch for Belarus, Metropolitan Filaret, who was present in the hall. Mr. Lukashenko asked to convey cordial greetings and best wishes to His Holiness Patriarch Kirill of Moscow and All Russia. Next to speak were Archbishop Tadeusz Kondrusiewicz of Minsk and Mogilev, Apostolic Nuncio in Belarus Claudio Gugerotti, and H. E. Francisco Javier Cardinal Martinez, Archbishop of Granada. Speaking in response to the participants in the Forum, President A. Lukashenko underlined that Christian values need to be defended in today’s Europe as they constitute the foundation on which the life of European nations should be built. He noted that after the disintegration of the Soviet Union, many sought to develop a new ideology to replace the former one, but failed. There are sacred Christian values; they are the foundation on which the Byelorussian people build their life today. The unity of the nation is directly linked with the preservation of these values, Mr. Likashenko said.